Review: Dai Jianyong (COCA)’s project in New York. 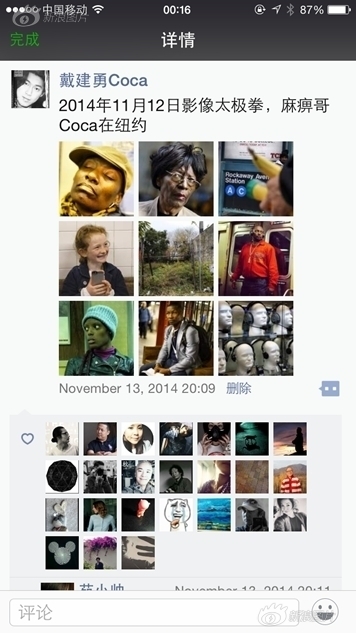 Photographs on Dai Jianyong’s Wechat. From 2014 to 2015, it has been a good year for Dai Jianyong until last month. He went to New York to be a resident artist for 3 months and won a few rewards. He joined influential artistic projects in Beijing and considered to move to Beijing. When I met him during my research in Beijing, I agreed to write a review about his new project. This Chinese review was published on Sina.com, which is also the owner of Chinese twitter Weibo. Then, things turned tougher for Dai in last month. Fortunately, it’s alright now. I hope he has a brighter future. Good luck. I am a Ph.D. candidate at the University of Essex, studying 'news' photography in China.